Learn when to harvest and how to cure storing onions to provide delicious flavor to winter soups, bone broths, chili, stews, and roasts. 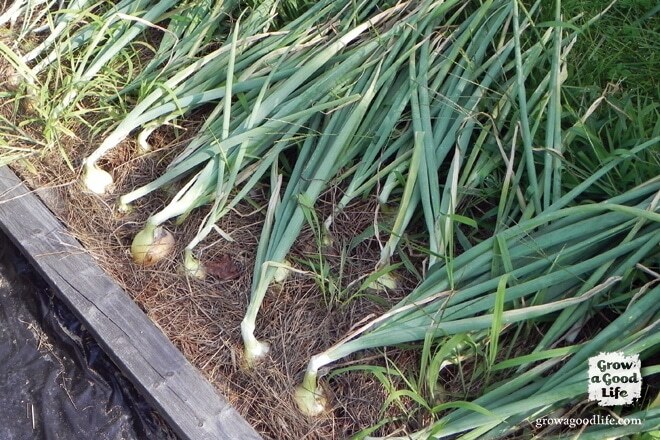 I grow several varieties of onions each year including quick maturing scallions and other varieties fresh eating. However, the majority of onions that I grow are storing onions meant to last through the winter months until the next growing season. Copra, Stuttgarter, and Redwing are my staple onions for long term storing over winter. These varieties work wonderfully for winter soups, chili, stews, and roasts. When choosing onions to grow for winter storing, select varieties that are known for their long-term storage capabilities. Onions are also categorized as “short-day” onions or “long-day” onions. Long-day onions are what we grow in northern US plant hardiness Zones 6 and cooler. These are triggered to bulb when sunlight increases to 14-16 hours. Onions are the first seeds sown for the approaching growing season. The seeds are planted in January or February under grow lights, so they have plenty of time to grow before forming bulbs (See How to Grow Onions from Seed). Onions can also be planted from transplants or onion sets purchased online or at your local garden center. 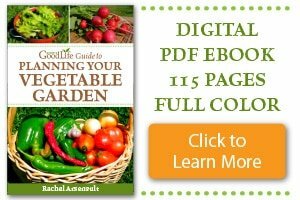 Here in the north, onion seedlings or onion sets are planted in the garden in early spring, usually in April and grow all summer long. Did you know that each hollow, green leaf represents a ring in the onion? 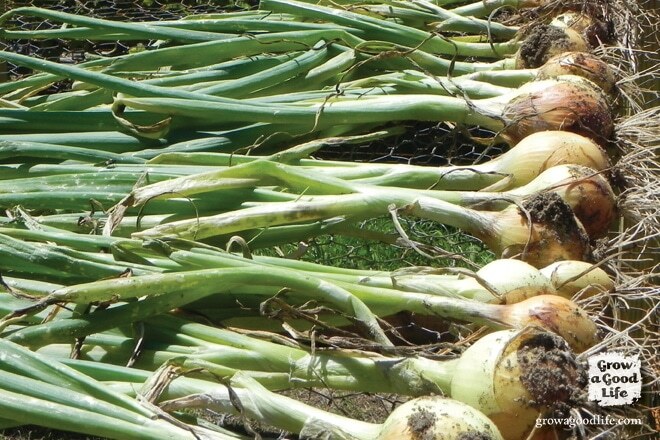 Strong, healthy foliage growth before the bulbs form results in larger onions when mature and ready for harvesting. Onions can be harvested at any time for fresh eating, but allow storing onions to mature fully to ensure the greatest storage capability. Onions are finished growing once the tops begin to flop over. Depending on the variety, this usually happens in the first few weeks of August in my Maine garden. Once the tops fall over, I stop watering and wait for a dry period to dig up the bulbs. 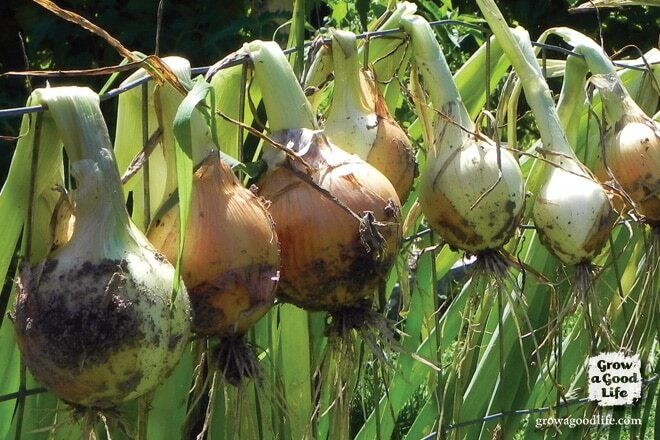 Try to harvest onions on an overcast day to reduce the sun damaging the bulbs. The easiest way to harvest a large amount of onions is to use a digging fork to carefully loosen the soil under the onions. 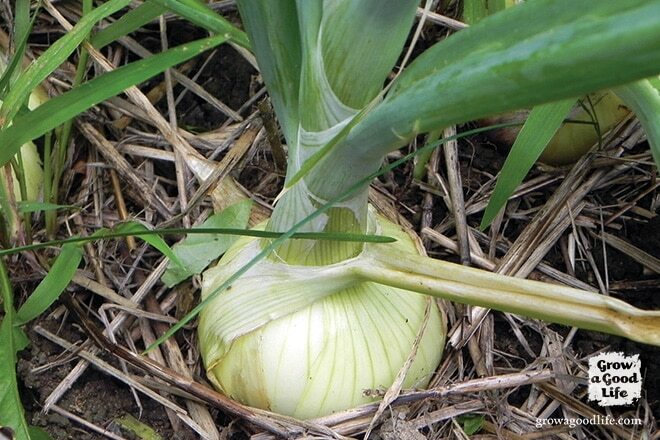 Once the soil is loose, grasp around the neck of the onion stalk and pull them up gently trying not to tear the roots, stalks, or bruise the bulbs because damage will reduce the onion’s storage life. If the sky remains cloudy, I like to spread out the onions on my garden fence so any soil that is still clinging to the bulbs can dry and be shaken of before bringing the onions inside to cure. Curing onions allows the outer layers to dry out and tighten forming a protective wrapping around the bulb. Onions cure best in a shaded, dry, and cool place. This can be in a shed or on a covered porch away from direct sunlight. Our summers are humid, so I usually bring the onions inside and spread them out on wire shelves in the basement where we run a dehumidifier to keep the moisture levels down. Curing can take several weeks to a month depending on the humidity level. Onions are finished curing when their outer skins turn papery, the foliage at the neck constructs, and the foliage shrivels and turns brown. Test one by cutting the stem about an inch from the bulb. The center of the cut area should not show any green. If it does, then the onions have not cured completely. Allow an additional week. Once the onions are fully cured and all the foliage is dry and crispy, I like to take the bundles back outside for cleaning and trimming before storing. Use scissors and cut the stems cleanly an inch or two from the bulbs and trim the roots. Brush the bulbs gently with your fingers to release any additional soil still clinging to the papery skin. Sometimes, the outer layer falls off. This is ok, but I try not to damage the skins any further than the first layer. Inspect the trimmed onions are carefully. Any blemishes, bruising, or damage to the onions will affect their storage potential. Set these aside and use first. 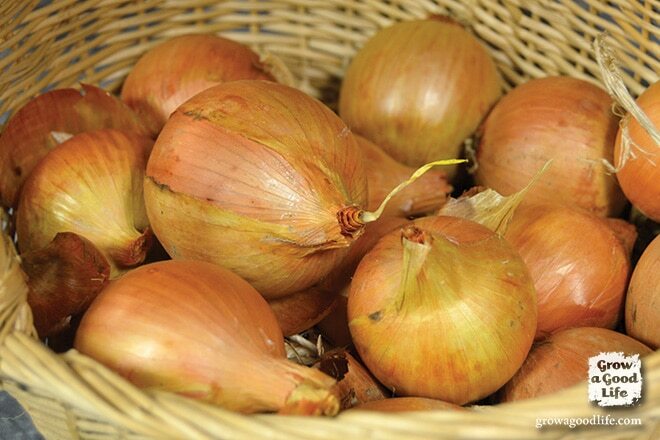 Store cured onions loosely in baskets or hung in mesh bags in a cool, dark, and dry location for winter. Ideal storage temperatures are around 35- 40˚F. Different varieties and storage conditions will affect how long they last. Copra and Stuttgarter usually last the longest for me and usually begin to get soft or sprout around April. Check the onions every few weeks and remove any that develop soft areas. Trim off any bad areas and either use the onion right away or freeze for later. Add frozen to stews, bone broth, or soup stock. I like to chop up some of my onions and pre measure out and put in zip lock bags and pop in the freezer. That way when I want onions in a dish but am short on time I just dump the pre measured onions in while my meat is cooking and they are perfect! Huge time saver and great way to store those extra onions that are reaching the end of their shelf life. Very helpful information for starting onion seeds. I dehydrate my onions. It seems to consume the least time and they last so much longer. Great post! Looking forward to getting our onions harvested in the next week. Thank you! I’m determined to grow onions next year. Thanks for sharing a great how-to on the Homestead Blog Hop! Great post! We’ve been getting loads of onions from our CSA this season and I’ve been thinking about how I want to save them. This has been very helpful! Fantastic tips & beautiful pictures. Hanging them on the fence to cure is a genius idea! I’m visiting from Our Simple Homestead blog hop. 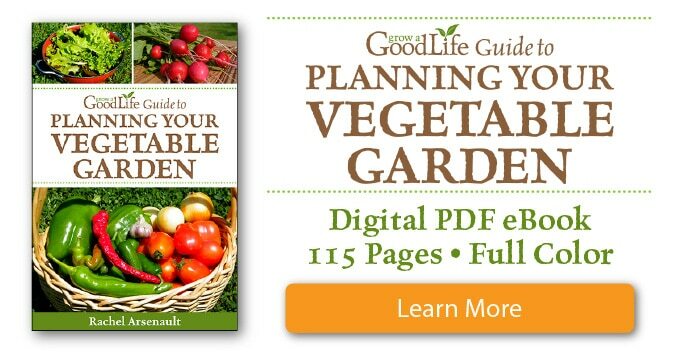 I planted 7 varieties of onion, leeks, and two garlic varieties…We love all of these so much!! My question is–if the tops flop over from little feet should they be harvested or will they still grow? Foliage still green and onions pretty small still. Let me know your thoughts. Thanks! Krista, They may still grow. I would let them go for a while and wait until the foliage begins to turn brown. My mother braided her onions instead of cutting the neck once they were cured. She hung them from nails around the edge of the store room in our basement. They can then be used by cutting them from the braid, bottom onions first. Laura, I love how pretty braided onions look. Plus it would be much easier to keep an eye on them to check for any rotting. What a fabulous article! Thank you! 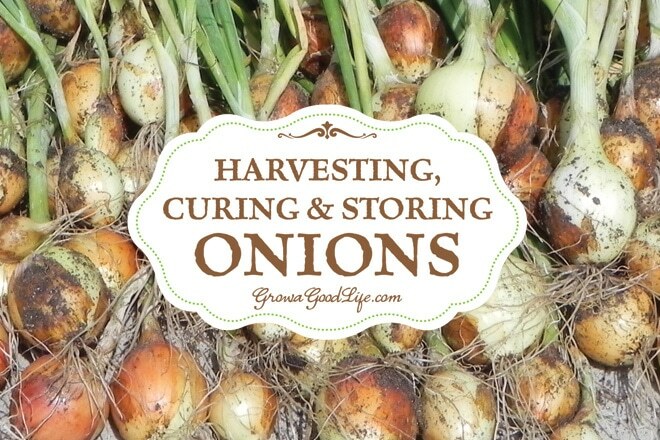 I always grow a lot of onions and did NOT know how to cure or store, so many many rotted.